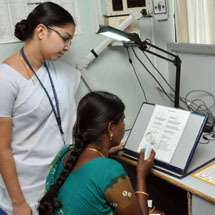 Cataract surgeries constitute more than half of the surgeries performed at Aravind. To enhance the efficiency and quality as well as output of this high-volume surgery, Aravind has acquired newer phaco machines that allows for safer and fast surgery with advanced fluidics technology system enabling early postoperative rehabilitation of patients. The newly acquired Hoya iTrace surgical work station is a complete diagnostic device based on advanced ray tracing technology that isolates and quantifies cornea versus lens aberration. It provides precise preoperative metrics, which allows surgeons to more accurately predict post surgical outcomes with greater confidence and improve the same by selecting the best IOL for each patient. It has also helped in better measurement and placement of Toric IOL. Lasik is increasingly becoming popular among patients with refractive errors. Considering this, all the Aravind tertiary centres have been offering the service for years on. As a promising step, the relatively new centre at Salem started offering this service from February 2014. The clinics at Aravind – Madurai, Pondicherry, Coimbatore and Tirunelveli have acquired the Femtosecond laser machine to improve the safety and precision of creating corneal flaps in lasik surgery. Descemets Stripping Endothelial Keratoplasty (DSEK), a procedure being widely performed at various Aravind centres, was introduced at Aravind – Tirunelveli in August. This procedure is safer than the conventional penetrating keratoplasty as well as assures faster recovery in patients with healthy anterior corneas. The Ocular Genetics service, yet to be officially inaugurated, already provides its services once a week during summer holidays and twice a week at other times. In the last one year, more than 1000 families recieved genetic consultations and counselling services. Aravind was one of the institutes involved in a collaborative initiative “Genetic Educators Project” with University of Pittsburgh, Pennsylvania, United States to study the possibility of the role of paramedical personnel as basic genetic educators with the results being very encouraging. Though ocular genetics and genetic testing is currently in its initial stages in India as in most other countries, it will play a great role in the near future and benefit several families. The department at Aravind - Coimbatore acquired portable PacScan machine, a combination of both Pachymetry and A-scan. The combination of a high frequency, low noise probe and fast precise algorithm enables scan capture immediately upon application of the probe along the visual axis. A collaborative effort has been initiated between Aravind - Pondicherry and Department of Health and Family Welfare, Government of Puducherry, at Rajiv Gandhi Women and Children Hospital to address Retinopathy of Prematurity. Memorandum of Understanding was signed on August 8 to conduct screening for ROP at the hospital. The necessary screening expenditure will be borne entirely by Aravind Eye Hospital and treatment will also be subsidized by Aravind. Expansion of the clinic facility and introduction of new measures at Aravind - Madurai have proved to be of immense benefit to the patients as well as the staff. A small unit of the biochemistry lab is now set up inside the clinic which makes it easy especially for patients with diabetic retinopathy who otherwise had to go to a separate floor for blood tests. The clinic has always been in collaboration with leading hospitals in and around Madurai for screening of babies for Retinopathy of Prematurity. Last year a children’s hospital was added to this network with a view to strengthening screening for the disease. At Aravind - Coimbatore, the clinic in collaboration with Lions Club International and Dr. Rajendran’s Diabetes Centre organized blood sugar screening camps in 150 locations. The camp conducted as part of World Diabetes Day turned out to be a Guinness world record by screening 36, 200 people free of cost in one day. Aravind - Tirunelveli and Pondicherry acquired Pascal photocoagulator, used to treat a variety of retinal diseases such as diabetic retinopathy, age-related macular degeneration, and retinal vascular occlusive disease in March. In collaboration with Sightsavers India, the clinic along with professionals from SarvaSikshaAbhiyan (SSA) initiated a project to provide low vision services to children. In the first phase, the clinic at Aravind - Madurai screened school children with low vision and provided low vision aids along with educational counselling. Three districts - Madurai, Theni and Ramanathapuram with 34 blocks were covered in this project during the year 2013. Special education teachers were involved in prescreening and mobilising children to the camp site. Overall 2,238 prescreened children were screened. Out of them 461 children were found to have refractive errors. 34 children had incurable low vision and were provided with low vision aids through the project. In the second phase Sightsavers worked with Aravind in organizing a training programme to the special educators with a curriculum covering all aspects of low vision. A total of 60 participants from 30 districts in Tamil Nadu participated in this training programme. The participants were given low vision kits at the end. Upon return to their respective centres, these teachers organized low vision training session for special educators, school teachers and parents. The clinic has been collaborating actively with Indian Council for Medical Research (ICMR) along with other centres in India in establishing the National Retinoblastoma Registry since March 2009 and has enrolled nearly 220 patients till March 2014. These retinoblastoma patients have been followed up closely over the years and appropriate treatment along with cosmetic rehabilitation has been done. A new initiative to enhance Retinoblastoma awareness were the activities conducted during Retinoblastoma Awareness Week from May 13 - 18. Posters about Retinoblastoma and its treatment options were displayed in various departments. Dr. Usha Kim spoke to various patients and their attendants to increase awareness about this life and vision threatening childhood cancer. A new beginning in the field of ocular genetics was the clinic’s efforts towards establishing a “Centre for Excellence in Retinoblastoma Genetics”. Samples are being collected and genetic analysis of the entire family of retinoblastoma patients is being performed as part of standard management protocol. During the last year, significant genetic mutations accounting for sporadic or heritable disease in nearly 12 retinoblastoma patients were identified. This data is being utilized for genetic counselling in these families. The prosthetic eye unit in the clinic has been rendering excellent service to patients who have had their eyes removed, either partially or totally. Initiatives were taken in the last year to upgrade its services to include silicone prosthesis. A two member team was sent to Smile in Dental Clinic, Pune for a formal training in silicon prosthesis in April 2013 following which the clinic introduced the service in August. This is the first of its kind in entire Tamil Nadu. The clinic, during the last year, has dispensed nine highly affordable customized silicon prostheses that provide superior cosmetic appearance. Aurolab Aqueous Drainage Implant (AADI) is a potential solution to the cost barrier of glaucoma drainage devices in the developing countries. The safety, efficacy of AADI was established by analyzing the IOP control, number of glaucoma medications, visual acuity of 30 patients with refractory glaucoma who underwent the AADI implantation and followed up for a minimum of 18 months postoperatively. Video film on this affordable aqueous drainage implant won major recognitions at the World Glaucoma Congress at Vancouver, Canada in July and at the Annual Conference of Glaucoma Society of India (GSI) at Indore in September. Automated image analysis for glaucoma detection – an Aravind – Indian Institute of Information Technology, Hyderabad collaboration was awarded the best free paper at the Glaucoma Society of India annual meeting at Indore. In the South Indian population screened at glaucoma services across AECS, (the Indian Family Angle Closure Study), the siblings of individuals with angle closure disease had 10-30% higher risk of angle closure when compared to control subjects. Screening of siblings of angle closure disease is likely to increase detection of angle closure disease in the population early so that glaucoma can be prevented by a simple laser intervention. Patient recruitment was completed for a large, multicentre, randomized trial at AECS comparing the safety, efficacy of starting treatment with Selective Laser Trabeculoplasty in POAG to starting treatment with Latanoprost eye drops. To commemorate the World Glaucoma Week, awareness activities including family screening camps, press meets and rallies were organized at all Aravind Eye Hospitals in March 2014. Uvea clinic at Madurai completed its twenty years of service. Comprehensive approach to diagnosis and treatment is achieved with the help of rheumatologists, pulmonologists, infectious disease specialists, dermatologists and radiologists. The clinic encountered two epidemic outbreaks of infectious uveitis and one endemic idiopathic infectious uveitis and was very fortunate to be able to resolve the etiology. Those three novel etiologies include Leptospiral uveitis, West Nile virus retinitis and Trematode granulomas in children. It was a proud moment for the clinic when its study on west Nile Virus retinitis was published in the journal Ophthalmology (2013; 120(9):1820-6.) with the images on the cover page of the issue. Uvea clinic at Aravind - Pondicherry moved to new premises offering better ambience for the patients and the new facility was inaugurated on October 9.